Doha (VNA) – Vietnam will continue to consider the participation in Inter-Parliamentary Union (IPU) activities an important task to promote and protect its legitimate interests, thus helping increase its position in the international area, according to National Assembly (NA) Chairwoman Nguyen Thi Kim Ngan. Ngan made the statement at her meeting with IPU Secretary General Martin Chungong in Doha, Qatar, on April 8 on the sidelines of the 140th IPU Assembly. She affirmed that by taking part in such activities, the Vietnamese NA learns from other parliaments’ experience, thus contributing to improving its operations, and expressed her satisfaction with the results of cooperation between the Vietnamese legislature, the IPU, and the United Nations in Vietnam towards realising parliamentary partnership. 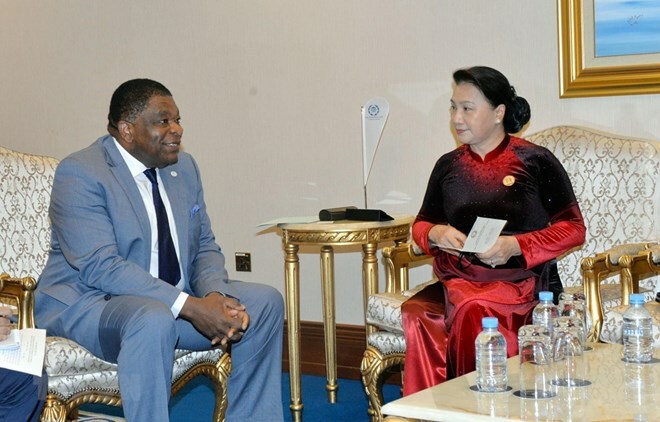 Martin Chungong, in turn, confirmed that the IPU is willing to cooperate with Vietnam in the field of nutrition. He expressed high expectations for the continued promotion of the implementation of sustainable development goals in Vietnam.